This was a set of temporary signage for a three-day conference called DEEP (Designing Enabling Economies and Policies) which was held from July 12–14, 2013. 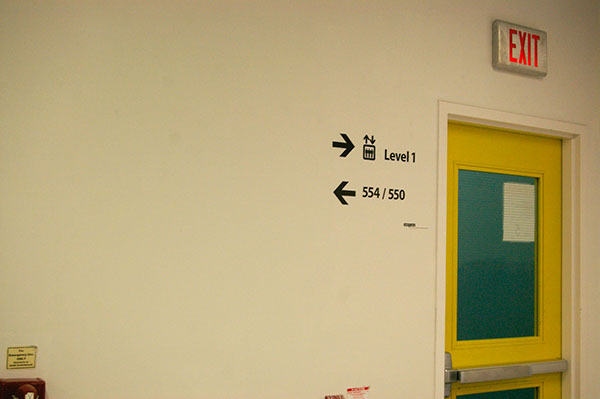 The signage was designed to compensate for the general lack of and poor placement of existing directional signage at the venue, as well as a lack of visible identification signs at certain key locations. The final design included 36 unique signs placed on three floors at 43 locations. Due to budgetary constraints all signs were printed on ordinary letter-sized paper. The design of the signage system went through a relatively standard process beginning with a visit to the site, followed by the marking up of floor plans, drafting of a sign message schedule, and on-site testing of sign visibility.